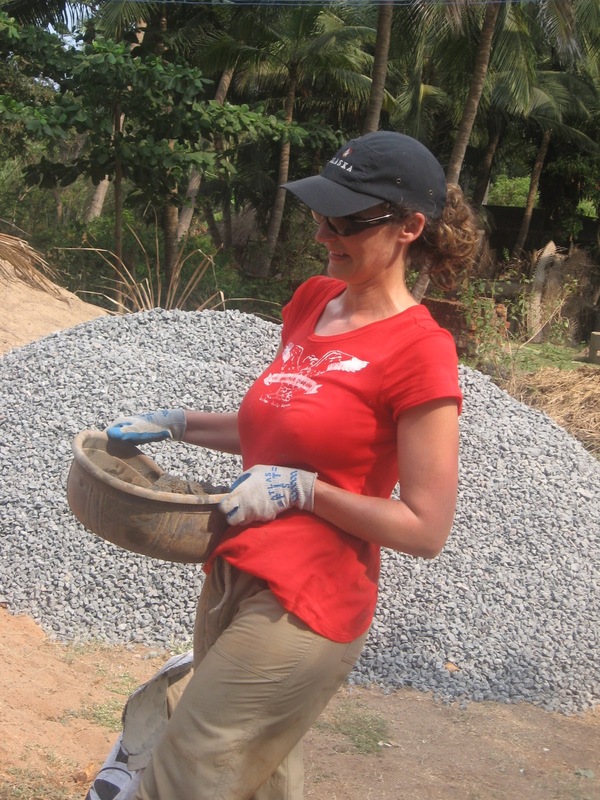 Volunteering in India.............. one brick at a time: Day 3: All New Jobs!!!! 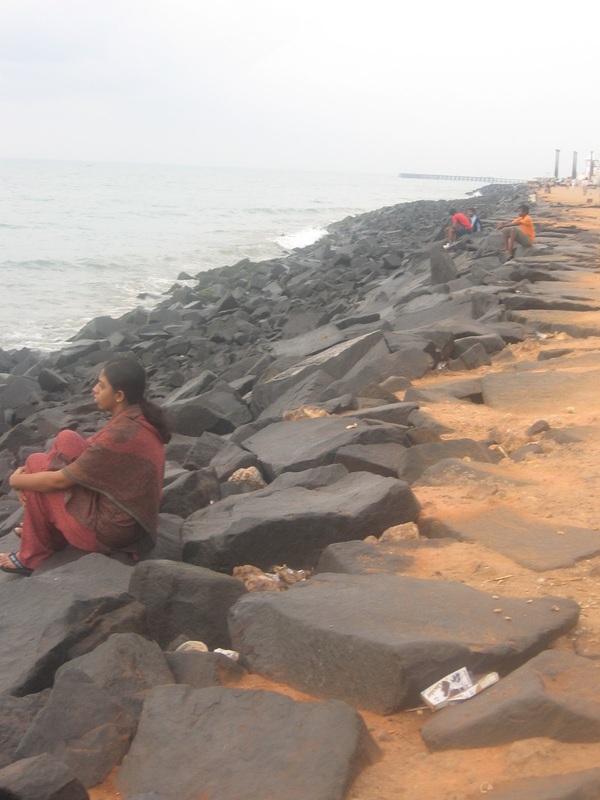 Before we headed to the village today, many of us decided to check our the promenade in Pondicherry. 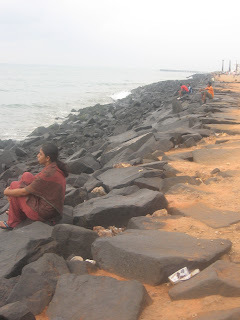 Being that it is along the Bay of Bengal we assumed there would be a nice breeze at 6:30am to cool us off a bit, but unfortunately is was completely calm and humid. So much for our refreshing walk before we headed into the heat for another day of work. There were lots of people walking...and running...along the promenade and you could see people fishing just off in the distance. This area is closed off to cars, so it was really nice to not have to worry about getting run over!!! We arrived back at our hotel for breakfast...not refreshed, but sweaty and hot... at 7:30am and we all agreed we would not be doing that again!!! Today we thought we were going to be digging holes for a new house, but when we arrived at the village, Sundar, our foreman on the build told us we would be working on a house that had already been started, and some of us would be finishing up the holes at the first house. Needless to say I was very excited to learn we would not be digging holes again...that is back breaking and hot work. When my team arrived at the house we were told there were many jobs to be done. 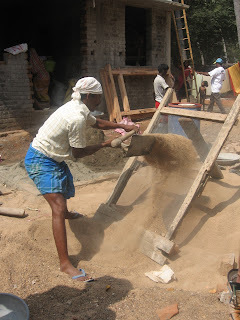 One guy needed help putting on the prime coat on the house, another one needed sand sifted...they use the fine sand to mix with the cement to create mortar and they also needed people to carry bowls of mortar to the mason's who were doing the ceiling. I started out sifting sand. This is quite a process...everything here is back to the basics. They created this sifter with a screen that they leaned against a post and we would scoop sand from a pile and throw it again the screen. The fine sand would pass through and the larger rocks would then be put in another pile for use at a later date. This isn't that hard of work, but in the direct sunlight with no breeze it was exhausting....35+ degrees, plus the humidity makes it feel like mid 40's. Three of us were doing this for the first 30 minutes or so. I would skim off sand from the pile...you can't go too deep or the sand is wet and it won't go through the screen. I would put it in bowls and then dump them close to those who were scooping it up and throwing it again the screen. Once I did this for a while, I decided to help out with the mortar....way too hot for me!!! There were two piles of mortar being mixed. One that was runnier than the other. The runnier pile was for the initial coat that went on the ceiling. The second pile was thicker and that went on next. They would take a clump of the mortar and just throw it up onto the ceiling and most of it would stick. My job was to pass bowls of the thick mortar to the mason as he threw it on the ceiling. Pretty interesting work to watch...the people here work VERY hard and are very fast at what they do. Once the mortar is put up on the ceiling they then smoothed it out and fill in any spots that remained. This created a plastered ceiling when it was finished. We did this for the morning...I was completely drained from working in the sun. Over lunch hour I went for a walk and saw many of the local villagers. Each day we are here they get more comfortable with us and come out to say hi. 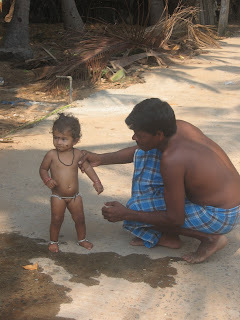 Today I came across a man and woman bathing their little girl and they wanted me to take a picture....they love to look at the pictures after you take them. The baby wasn't quite sure what to make of it all!!! The babies here wear little chains on their bellies and around their ankles that jingled as they walk. They have some sort of significance, but I haven't completely figured it out yet. 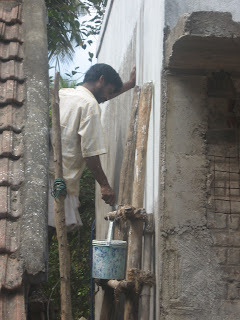 After lunch I switched jobs and went to help at the first house. The holes were now dug and we had to start putting in the foundation. This time we needed to get 22 bowls of sand from a pile and carry them to the road. Then we mixed half a bag of cement with it. Once this was done, we threw the mixture on the large pieces of gravel that were in a pile by the road. Water was poured on it and then mixed all together. We then filled bowls of this rock mixture and carried them to one of the six holes we dug, handed them to the home owner and he would create a base in the hole. Once the base was created he would pack it down with some sort of tool and then we carried over more bowls of the cement and sand mixture and he poured a final coat over the rock mixture and then poured water over it. This created a concrete base for the foundation we would be putting in. It took all afternoon to finish all six holes and we were very pleased to have finished it all by the end of the day. Another productive day in the village!!!! At about 4pm we started to clean up and put away the tools. It feels soooo nice to take off your shoes at the end of the day and sit back in the shade with some cold water. 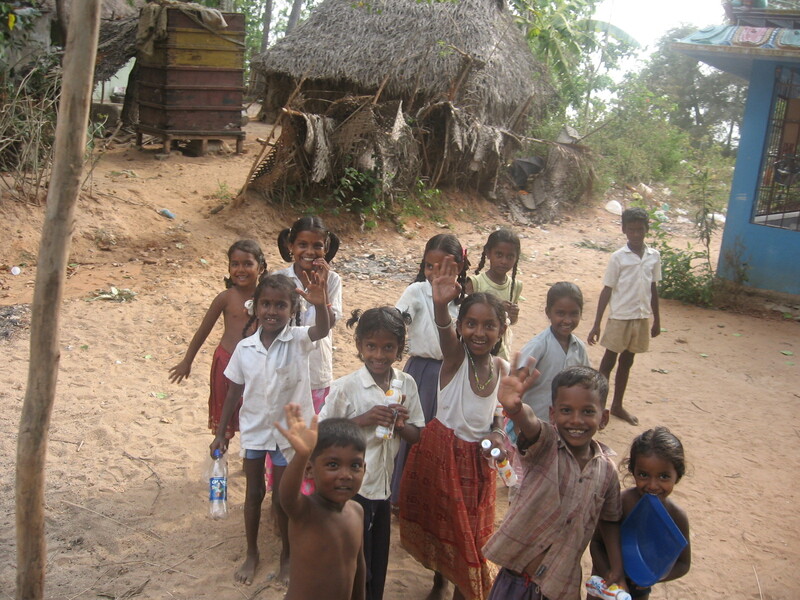 Every day now more children come to the build site. They are all on summer vacation right now, so there are lots of children around. They love to wave to use when we arrive and when we leave....very cute!!! So after a long day of work we headed back on our 45 minute bus ride, ready to relax for the rest of the evening....or so we thought. All of a sudden we heard this HUGE bang and we realized we blew a tire!!!! Always something...adds to the adventure. We all pile off the bus onto the side of the road and the driver and some of the guys start getting the spare and changing it on the side of the road. Now this is not the safest thing to be doing...they actually took a tree branch and placed it in the middle of the road so vehicles would move to the side. You really know you have a bunch of tourists when we are all standing around taking pictures of people changing a tire!!! 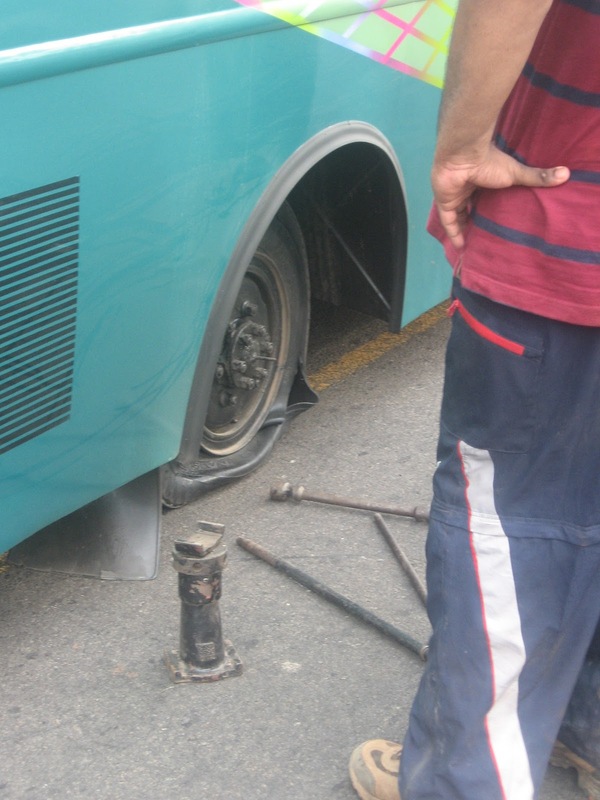 After about 15 minutes the tire was on, no one was hurt and we were headed back to Pondicherry. Another great day and looking forward to Thursday...our last day of work for this week.